Take your world with you—with an iPad! When you're a person who can't be chained to a desk, an iPad is your ideal tool for working or enjoying entertainment wherever you want, whenever you want. An iPad is an ideal tool for connecting to websites and networks, staying in touch with your family, keeping track of the office, or just settling in with a movie or a good book,. And to make it easier than ever, grab a copy of iPad For Dummies for simple steps on handling all your iPad's basic functions—as well as iOS 11, the latest version of the software that powers Apple's mobile gadgets. Assuming no prior experience with an Apple tablet, this hands-on guide helps users from every walk of life navigate their way around an iPad and an iOS 11. From setting up your eMailbox and using your iPad as an eReader to finding the best iPad apps and using voice commands, it covers everything you need to squeeze all the value out of your portable device. iPad rookies rejoice! You'll be up and running like the pros in a flash! Bob "Dr. Mac" LeVitus writes the popular "Dr. Mac" column for the Houston Chronicle. Edward C. Baig is the personal technology columnist for USA Today. 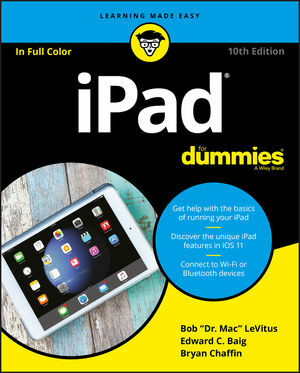 Together, Bob and Ed have coauthored all editions of both iPad For Dummies and iPhone For Dummies. Bryan Chaffin is Editor-in-Chief of The Mac Observer.